Elisa Beshero-Bondar is Associate Professor of English and Director of the Center for the Digital Text at the University of Pittsburgh, Greensburg. She is the founder and principal editor of the Digital Mitford project. Dr Daniel Cook is Senior Lecturer in English and Associate Director of The Centre for Scottish Culture at the University of Dundee. Daniel has published widely on eighteenth-century and Romantic-period literature and biography, including his first monograph, Thomas Chatterton and Neglected Genius, 1760–1830 (Palgrave, 2013). The Afterlives of Eighteenth-Century Fiction (Cambridge University Press, 2015) is out now. Dana Van Kooy is Associate Professor of Transnational Literature, Literary Theory and Culture and the Director of the English Program within the Humanities department at Michigan Technological University. Her publications include Shelley’s Radical Stages: Performance and Cultural Memory in the Post-Napoleonic Era (Routledge, 2016) and articles, which have been published in Modern Drama, Theatre Journal, Romanticism, and a forthcoming essay in Studies in Romanticism. She has also written articles about Percy Shelley’s Hellas and nineteenth-century tragedy for edited collections. As part of this ongoing series on Teaching Romanticism we will consider the ways in which we lecture on and discuss individual authors, whether during author-specific modules or broader period surveys. I thought it would be particularly useful to hear about which texts educators use and in what context, whether they place certain poems or prose works against those of other writers, or use contemporary or modern theoretical texts, or something else entirely. For this strand of blog posts I invite academics across the world to share their advice and tips on any aspect that interests them about teaching Romanticism. Many thanks to all of those who answered my call through NASSR-L, The BARS Review, and elsewhere (lightly edited samples are reproduced below with permission of the authors). Please do feel free to contact me with proposals for future subjects. We will be considering a range of writers, canonical and non-canonical alike, in the coming months. This eight-part issue was edited by Dana Van Kooy. Abstract: The Digital Mitford project aims to release our drama module in the coming year, with a guide linking each play with letters that reference it. The following essay updates a talk I gave at ICR in 2012, months before we launched the Digital Mitford project. This essay serves as an introduction to the exciting politics of authorship and collaboration in Mitford’s tragedies, and draws from Mitford’s letters to speak to the hybrid origins of Julian. Those seeking opportunities to complicate students’ views of authorship have wonderful teaching examples in the Romantic era, from the pages of Dorothy Wordsworth’s journals and William Wordsworth’s poems to more complex examples of collaboration, appropriation, and remixing. The Romantic myth of the solitary authorial genius is well and fitly exploded after examining the compelling range of intertextual evidence. Working with Romantic drama, perhaps our focus in teaching and writing shifts from simply chipping away at the myth of solitary inspiration to cast, instead, a spotlight on the interactions between dramatists, managers and performers. We are well aware that performers reconfigure the script through their voice and action. 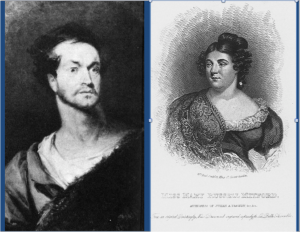 Romanticists interested in performed drama have a wonderful opportunity to call attention to the tense politics between authors and actors in the highly successful early plays of Mary Russell Mitford . . . or should we describe them as the highly successful early plays of Mary Russell Mitford and William Charles Macready? If Mitford’s writing for London’s Royal Theatres was not an experience of what Roland Barthes referred to in 1967 as the death of the author, it was an agonized and anxiety-ridden experience of compromise and negotiation, in which the star of show demanded a degree of access to revising the script akin to the “choose your own adventure” books of our time. 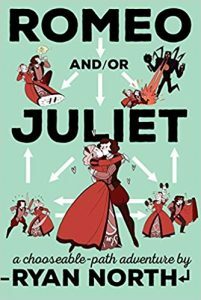 Late-breaking revisions and challenges from the actor to the author help to illuminate contentious elements of the original play, giving us an additional scene of meta-narrative to investigate in Romantic-period drama. How will the author be compelled to change her play, and what aspects of the performance are most subject to takeover by the actor-manager? The preserving of multiple versions under negotiation between author and actors serves to underscore their tensions and the volatility of performance production in Romantic drama. Mary Russell Mitford shared with Percy Bysshe Shelley, Joanna Baillie, and other dramatists a “star-struck” experience with the London stage, and each developed tragedies with a star tragedian in mind for the lead parts. In 1819, Shelley envisioned Edmund Kean and Eliza O’Neill as his male and female leads in a performance of The Cenci at Covent Garden. A year later, on December 6, 1820, Mary Mitford first saw William Charles Macready perform the lead in C.E. Walker’s play, Wallace at Covent Garden, and in the same month she set to work designing her first play for him. Throughout the decade, she wrote and developed multiple plays with Macready in mind for title roles and lead parts. Not until March 1823 would Mitford see a play she had drafted in production, when her tragedy, Julian, was launched successfully with Macready in the starring role. Left: William Charles Macready as William Tell, from an oil painting of 1826-1827 by the American artist Henry Inman. Right: Mary Russell Mitford, as author of Julian. Mitford negotiated, compromised, and rewrote Julian during an emotionally charged period in 1823, while her play Foscari, drafted earlier in 1821, was continually delayed from production until 1826. Mitford and Macready worked closely with members of the Kemble family and Mitford’s friend, Thomas Noon Talfourd (the same Talfourd who later famously defended Dickens in the interests of authorial copyright). Macready, as an actor-manager, proved unwilling to share the stage with his rival, Charles Kemble, and Mitford, caught in the middle, was afraid to give offense to either party. By the end of the 1820s, Mitford would be celebrated as an author of Julian, Foscari, Charles the First (not performed until 1834), and Rienzi, historical tragedies enacting regicide and the toppling of ancestral regimes, but if scholars of Romantic drama are tempted to locate Mitford’s personal political views in the language of her tragedies, we need to consider that the catastrophes of those plays and the voices and silences of compromised rulers, scheming traitors, and agitated rebels were the sites of heated contention and negotiation in the production process. For those of us studying the interesting moment of the 1820s in drama, it is fascinating to discover how contingent these plays’ catastrophes were on the will of those performing them. For Mitford, the financial stakes were high. She needed to support her parents after they lost their family fortune of £11,000 as well as their house and property in Reading in a prolonged Chancery suit. Although they had retrenched and moved to a little cottage in Three Mile Cross, Mitford was spurred on by financial insecurity. She devoted herself to writing for the stage, seeking advice frequently from Thomas Noon Talfourd, a graduate of Valpy’s school at Reading whom she had befriended around 1817. Mitford turned to Talfourd for help in making contact with Macready, Henry Harris, and Charles Kemble at Covent Garden Theatre, as well as in finding outlets for publishing her dramatic sketches. Within a year or two, Mitford established herself solidly with the periodical press, and could, in her turn, assist Talfourd in finding publication opportunities in the Lady’s Monthly Magazine. Despite the persistent threat of impending poverty, Mitford was distinctly well prepared to take up the drama, given her education and her life in Reading, with its unusually active local theatre culture. During her years at school in Chelsea between 1798 and 1802, her teacher Frances Rowden took her to see performances by John Kemble and Sarah Siddons at Drury Lane Theatre, and later Dr. Valpy, Master of Reading School encouraged her attendance at his unusual productions of ancient Greek plays, performed by the boys at Reading School. At Valpy’s request, Mitford reviewed his students’ performances in the local Reading Mercury. She memorized scenes from Shakespeare’s plays, and read widely in classical, Renaissance, and eighteenth-century drama. When she learned of the obscure C.E. Walker’s earning “several hundred pounds” for what was surely not the best of plays, and when she saw Charles Macready’s performance, she was motivated to make a serious effort to write historical tragedies for the potentially lucrative market of the London Theatres Royal. Mitford’s theatre background combined with her success in previous decades with publishing narrative poetry prepared her for the great efforts she undertook in the 1820s, despite the fact that her success in bringing four plays to production in the Royal Theatres induced considerable stress. “God grant I may make money of it,” she wrote to Talfourd in January 1821. She sought help repeatedly from Talfourd, Barbara Hofland, and Eleanour Porden, as well as her esteemed friend, Miss James, at one point joking to Talfourd in June 1821 that the whole group “should be taken up for Conspirators” in helping her to scheme plots of rebellion and civil war for the stage. At the point when Mitford first saw him perform as Wallace, William Macready was a star on the rise, ironically, during a period generally lamented as a decline in English national theatre following the retirements of Sarah Siddons and John Philip Kemble. Macready played opposite the inimitable Sarah Siddons in the final scene of her last play in June 1819. Late in 1819 reviews were already beginning to compare Macready favorably to Edmund Kean, six years his senior, and Macready had turned around a bad season for Covent Garden with his performance of Richard III. Macready’s biographer, William Archer describes an electrified audience demanding Macready come out after the curtain call, literally to raise his character from the dead! Son of the William Macready who had played at Covent Garden in the 1790s and managed a theatre company, William Charles Macready had been unusually well educated at Rugby School, and as Mitford noticed in corresponding with him, he cultivated both an elevated taste in poetry and high literary standards for theatre. He made his performance debut at his father’s debt-ridden theatre company in Birmingham and gained experience in theatre management in attempting to repair the financial damage left by his parents, so that the actors in their Chester company could be paid. Reviews throughout the 1810s describe his physical awkwardness on stage, but praise the emotional expressiveness of his eyes and voice. Early in his career he was frequently cast as a villain—playing Othello and Iago—but by the early 1820s he was beginning to have some say regarding his roles. For example, according to his 1890s biographer William Archer, in playing the part of the Duke in Barry Cornwall’s Mirandola, “Macready may be said to have collaborated” in developing this character (56). The father-son tensions of Cornwall’s plot and Macready’s role in collaboratively defining the character he would play seem strikingly similar to Mitford’s tragic plots and experiences with the star actor. Mitford’s now lost first play, Fiesco, was designed for Macready, and though it was never performed, it did apparently succeed in securing Macready’s interest in her writing a new play for him. Macready frequently requested that Mitford rewrite parts of her Foscari, and it seems likely he revised Mitford’s Julian. He also suggested to Mitford that she write a play on Charles I and Oliver Cromwell, making clear that at some point in Mitford’s career as a playwright, likely after the moderate success of Julian in 1823, Macready exerted considerable influence on her plots and characters as vehicles for his performances. Though Mitford wrote multiple plays with Macready in mind, it is significant that he would only perform in Julian, due to tensions between himself and Charles Kemble when neither would share the stage with the other after Kemble took on the management of Covent Garden. 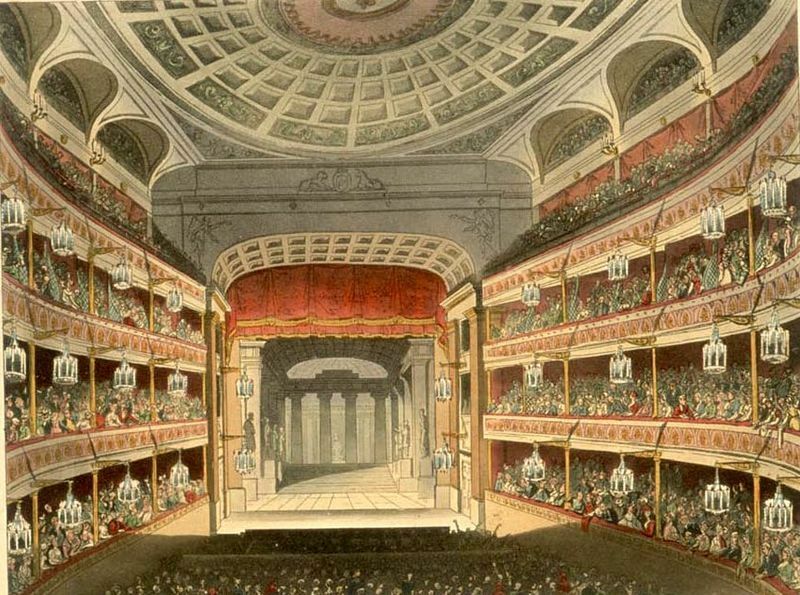 Covent Garden Theatre in the 1810s, in its second incarnation after the fire of 1808 destroyed the original building. Mitford’s letters from 1821 to 1823 register admiration yet increasing ambivalence toward Macready: She writes Talfourd on 24 March 1821 that she completely supports Macready’s decision to reject her draft play “Fiesco”: “I heartily agree with all that Mr. Macready says of Fiesco’s want of force and of situations […] Mr. Macready’s letter is very like his acting—he is quite poetical […] & above all he is kind. He seems to be trying to like Fiesco against his better judgment.” Between his letter and Talfourd’s encouragement, she “will write a good Tragedy, even if I first write eleven bad ones” (Coles 12). Later that spring, as she is developing Foscari, she consults Dr. John Moore’s A View of Society and Manners in Italy and wonders how much of the historical plot to include. She writes to Talfourd on 8 June 1821 worried over the development of her lead character in Foscari on two points, whether her play might be compared or confused with Byron’s Marino Faliero (since she did not yet know of his Two Foscari, forthcoming later that year), and whether the lead character is appealing and heroic enough: “This is the sort of character that would suit Mr. Charles Kemble—but would the hero be good enough for Mr. Macready?—I am afraid not—I look up to him as the very genius of all that is high & romantic & poetical in Tragedy & measure my plots & characters by his standard.” As she frets that summer over the lead character and over the play’s catastrophe, she seems intent on giving more “scope” to Macready’s powers if he is to play Francesco Foscari, the son of Doge Foscari. She is concerned at this point with whether young Foscari’s character is heroic enough, and she wants to reject the old classicist Dr. Valpy’s advice to wrap Francesco in suspicion, make him potentially guilty in the plot, only to have him revealed as unjustly persecuted in the end. Mitford expresses concern about how this characterization of young Foscari seems to “degrade” him into a “heroine of melodrama.” Gender troubles emerge in the back and forth over the play manuscript, over whose advice to follow and whether the play is “womanish.” On 9 November 1821 and in later letters to Talfourd, Mitford repeatedly mentions disappointment that Macready describes her tragedy as “evidently a lady’s.” Perhaps she will never be able to please him or ever “succeed in high Tragedy,” as she wrote on her birthday, 16 December 1821. If she cannot produce plays for the stage, and success will not come for many years, she cannot afford (literally) to continue the attempt. She considers going to Paris to find her old teacher Frances Rowden, “to learn of her the art of teaching or of seeming to teach,” though she does not want to leave her parents. If she could just be more confident, she could succeed; she would more happily stay at Three Mile Cross with her parents and write plays for Macready. She begins drafting Julian, first titled, The Melfi, in December 1821 and over the next year revises Foscari many times while developing the new play, and sharing other possible plots to develop, including by November 1822 the story of Cola di Rienzi (the heroic medieval Tribune of Rome, from Gibbon’s history, suggested by Eleanor Porden). 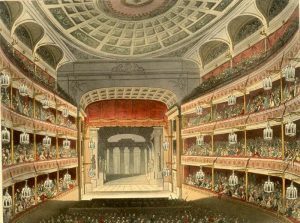 Rienzi would be, eventually, Mitford’s greatest success, running for 34 performances at Drury Lane in 1828. The vexing uncertainties of 1822 and 1823 kept Mitford in a state of distress: revising an act of Foscari for Charles Kemble who promised to bring the play forward, and then having her hopes dashed when Macready would not play opposite Kemble. By this time, she seems less enthralled with Macready than she was formerly, while he seems perhaps too confident of his authority over her. He does not like her proposed play about Rienzi, for example, and he suggests the play on Charles I and Cromwell instead. She, on the other hand, expresses her decided preference for the Rienzi plot, working with the historic career of a medieval Roman peasant-leader, Cola di Rienzi: “To include his elevation and fall in one place would be almost too startling—would it not? And yet the thing is tempting.—Rienzi should be as like Napoleon as one could make him” (Coles 218; 3 Nov. 1822). Eventually, she would produce both dramas, but Charles the First would be censored as a dangerous play by the Lord Chamberlain’s office, and would not be performed until the mid–1830s. Julian, on the other hand, succeeded in engaging Macready speedily. 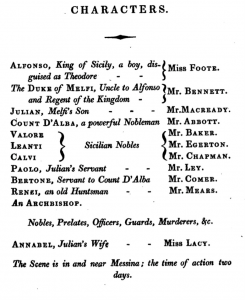 Once he determined not to play opposite Kemble in Foscari, he read Mitford’s new play manuscript in February 1823 and brought out the play within weeks, with himself in the starring role, a new actor, Mr. Bennett appearing opposite him, and Miss Foote acting the part of the young boy prince Alfonso who endures the attempted murder and usurpation of his rightful crown. 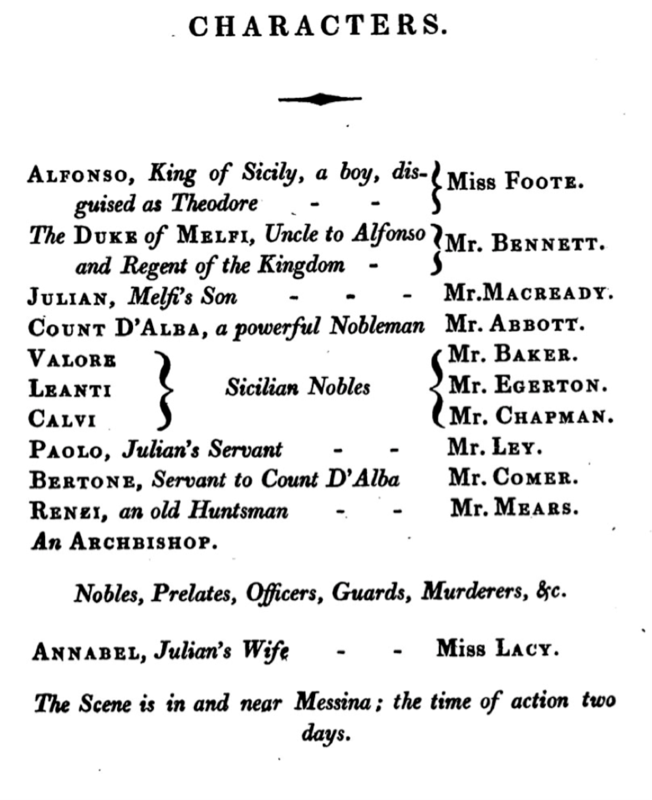 Set in Sicily, this play resembles Felicia Hemans’s Vespers of Palermo (brought out later that year for one failed performance in Dec. 1823), though Mitford’s was the more successful of the two, running for eight performances in March that year. As Diego Saglia observes, both plays almost certainly respond to the failed uprising of Sicilians against Bourbon rule in 1820, and each tragedy illuminates liberal ideals in its depiction of corrupt states and ineffective resistance movements. Mitford’s lead character Julian pointedly withdraws and will not speak about what grieves him, though in this case he will not speak out even when his voice might undo usurpation and restore social order. In the first act’s opening scene, Julian recalls a nightmare that to his horror he confirms as reality: a sequence of events in which he forcibly intervenes to stop his father from assassinating the boy Prince Alfonso. Julian’s father, the traitorous Duke of Melfi, had been Prince Alfonso’s regent and had attempted to kill him on the way to the boy’s coronation. Julian thinks himself guilty of parricide, though he soon learns that his father still lives and now usurps Alfonso’s position as ruler of Sicily. In his turn, the Duke of Melfi believes Alfonso dead at first, though the boy survives, disguised as Julian’s pageboy. The self-suppression of both Julian and Alfonso in the face of the usurpation is rendered poignantly throughout the play. Neither the boy prince nor Julian will move against Melfi when they discover his survival and the reality of his rule over Sicily, and both are tormented by feelings of guilt over Julian’s attempted rescue. The boy prince thinks himself unworthy of rule and he prefers the guidance of Julian’s family in all things, while Julian will not compound the guilt he feels in striking against his father, and can only support the prince in privately upbraiding the Duke rather than moving against him in open rebellion. The silence of both Julian and Alfonso sharply illuminates the corruption of state such that, at best, only a puppet government might be envisioned for Alfonso, and even the prince’s restoration is not something desirable when it advances the schemes of Julian’s powerful enemies. Dares question me? What are ye, Sirs? Jul. The States! Without a head! Without a King! Without a Regent! States! To bloody trial, him your Greatest? Here, too! Here! Will ye build up scaffolds in your churches? And turn grave priests to beadsmen? I’ll not answer. This revision gives Julian a powerful statement of resistance, perhaps more overtly political. Macready appears to be unchaining the truth that Mitford’s version would show on the stage to be bound. In giving Julian a speech here, he asserts resistance; whereas before, following Mitford’s script, Julian demonstrates his lack of freedom through body language and perhaps expressive gesture. Mitford’s tensions with Macready and Covent Garden had been steadily increasing during the time of Julian’s production. Robert Elliston of Drury Lane Theatre may well have been the cause, since he had enticed the other leading Covent Garden actors (including Philip Young) away to Drury Lane with an offer to treble their pay. After Julian’s production Elliston invited Mitford to withdraw her play from Covent Garden and send it to Drury Lane so she need no longer suffer setbacks. As Mitford saw it, only Miss Foote and Macready performed well in her play, with the rest of Covent Garden’s talent having departed. Though Julian ran for a week, she and Talfourd suspected it was stopped to minimize her payment as the author. Archer’s 1890 biography of Macready, however, blamed a “womanishness in the character of Julian that sapped its otherwise undeniable merit” (61)—and in this he seems to have echoed the theater critics of the 1820s. The attribute of “womanishness” might not be so far off the mark, from a different point of view. Sarah Siddons had been famous for silent poses, which, as Fred Burwick describes, “allows the motionless gesture to displace speech.” Since the boy-prince Alfonso was played by a woman, such Siddons-like communication through silence might have seemed to Macready better suited to Miss Foote. Julian’s breaking silence to speak calls attention to spectacles of authority in refusing abjection, and may well anticipate the overt questioning of institutional forms that Mitford would later apply in her most successful play Rienzi. Julian, however, may have raised significant gender issues, and—ironically enough—may have challenged Macready to act the uncomfortable “womanish” part of mute resistance to overbearing authority. One almost wonders if, after a year and more of disappointment and delay, in scripting Julian, Mitford no longer wanted her favorite actor to play a role he would exult in. Her childhood friend (and Byron’s school friend) William Harness eventually published a letter in Blackwood’s Edinburgh Magazine in June 1825 that ultimately poisoned Macready’s relationship with Mitford, since he assumed she had written it. Harness explicitly condemned Macready’s abysmal behavior to Mitford, in effect jerking her along, demanding rewrites to the script (at that time of Rienzi) within an unreasonable time frame, and further protested the overweening power of the new “stars” in theatre, Kean, Young, and Macready, for forcing poets to work for them instead of serving a higher art. Thereby, claimed Harness, Macready and his ilk—that is, the new actor-managers with their unprecedented authority to pick and choose their preferred plays and parts—were degrading the English theatre to swell their own profits. For her part, Mitford had to devote considerable energy to mollifying the competitive actor-managers of Drury Lane and Covent Garden in order to achieve her status as a leading tragedian of the 1820s, alongside the celebrity status she achieved in England and America for Our Village. Armstrong, James. “Shelley’s UNsung Muse: Eliza O’Neill and the Inspiration Behind The Cenci.” Theatre Notebook 69.1 (2015): 17-39. Burwick, Frederick. Playing to the Crowd. New York: Palgrave Macmillan, 2011. —. Romantic Drama: Acting and Reacting. Cambridge University Press, 2009. Cox, Jeffrey N. “Introduction.” Seven Gothic Dramas: 1789-1825. Athens, OH: Ohio UNiversity Press, 1992. Pietropoli, Cecilia Pietropoli. “The Tale of the Two Foscaris from the Chronicles to the Historical Drama: Mary Mitford’s Foscari and Lord Byron’s The Two Foscari.” In British Romanticism and Italian Literature: Translating, Reviewing, Rewriting, ed. Laura Bandiera and Diego Saglia. Amsterdam: Rodopi, 2005. 209-220. Saglia, Diego. “Mediterranean Unrest: 1820s Verse Tragedies and Revolutions in the South.” Romanticism 11.1 (2005): 99-113. See Jeffrey Cox, Introduction, Seven Gothic Dramas: 1789-1825 (Athens, Ohio: Ohio University Press, 1992), 11 on this era being the Age of Kemble and Siddons. Ironically, given the impetus of its production, The Cenci wasn’t performed until 1886. See James Armstrong, “Shelley’s Unsung Muse: Eliza O’Neill and the Inspiration Behind The Cenci,” Theatre Notebook 69:1 (2015): 17-39, 35. Lord Byron’s The Two Foscari was published in 1821, though Mitford appears not to have been aware of it at first, and though the two took very different approaches to the same Italian source material, some of Mitford’s anxieties in bringing Foscari to the stage had to do with the appearance that she might be merely copying the famous exiled lord. On Mitford and the larger contexts of Italian historical tragedies in England, see Diego Saglia, “Mediterranean Unrest: 1820s Verse Tragedies and Revolutions in the South” Romanticism 11.1 (2005): 99-113; Cecilia Pietropoli, “The Tale of the Two Foscaris from the Chronicles to the Historical Drama: Mary Mitford’s Foscari and Lord Byron’s The Two Foscari” British Romanticism and Italian Literature: Translating, Reviewing, Rewriting, ed. Laura Bandiera and Diego Saglia (Amsterdam: Rodopi, 2005), 209-220 ; and Frederick Burwick, Playing to the Crowd (New York: Palgrave Macmillan, 2011), 87-100. William Archer, William Charles Macready (New York: Longmans, Green, and Co., 1890), 50. William Allan Coles, The Correspondence of Mary Russell Mitford and Thomas Noon Talfourd (1821-1825), Harvard University Dissertation, 1956. Diego Saglia, “Mediterranean Unrest: 1820s Verse Tragedies and Revolutions in the South,” Romanticism 11.1 (2005): 99-113. Frederick Burwick, Romantic Drama: Acting and Reacting (Cambridge University Press, 2009), 98.